Israeli Ground Operation In Gaza Continues : The Two-Way Three dozen Palestinians and one Israeli solider have died since tanks rolled in late Thursday. It's the first time in five years that Israel has sent ground troops into a conflict. 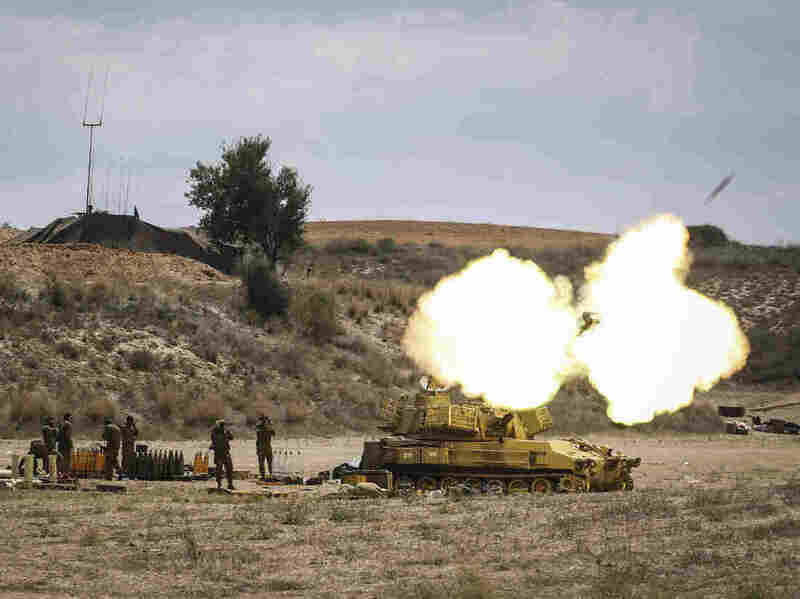 An Israeli artillery shell is fired at the border with Gaza on Friday near Sderot, Israel. Late Thursday night Israeli forces escalated their operation with a ground offensive, sending troops into Gaza. More than 250 Palestinians have lost their lives since Israel began operation "Protective Edge." U.N. Secretary-General Ban Ki-moon will travel to the Middle East on Saturday in hopes of finding a way to stop the fighting between Israel and Hamas. "Israel has legitimate security concerns, and we condemn the indiscriminate rocket fire from Gaza into Israel that ended yesterday's temporary cease-fire," Jeffrey Feltman, deputy U.N. secretary-general for political affairs, told the Security Council on Friday. "But we are alarmed by Israel's heavy response." The Palestinian death toll is now 285, according to a Gaza health official, with more than 30 killed since Israel launched a ground offensive late Thursday. More than 2,000 Palestinians have been injured. The homes of 1,890 families have been destroyed or rendered uninhabitable, according to the U.N. More than 48,000 people have been displaced. One Israeli soldier was killed Friday. Staff Sgt. Eitan Barak — Israel's first military fatality in the conflict and second overall — was killed by friendly fire. Rocket sirens sounded in Tel Aviv during a telephone conversation Friday between President Obama and Israeli Prime Minister Benjamin Netanyahu. "No nation should accept rockets being fired into its borders," Obama told reporters at a White House briefing. "I also made clear that the United States and our friends and allies are deeply concerned about the risks of further escalation and the loss of more innocent life." "Netanyahu told Obama that Hamas was responsible for the harm done to Palestinian civilians in Gaza who are being used as human shields," according to the Jerusalem Post. Israeli tanks and troops entered the Gaza Strip as part of a ground invasion late Thursday, heightening a conflict that so far had been restricted mainly to an air war with Hamas militants. NPR's Ari Shapiro, who is in Jerusalem, says that it's the first time in five years Israel has sent ground troops into a conflict. Among the army's main targets are the tunnels running between Gaza and Israel. The military says it stopped 13 Hamas militants coming through a tunnel. "We have to cut off the line that is entering Israel," Peter Lerner, a spokesman for the Israeli army, told Shapiro. Netanyahu told troops on Friday to remain ready for a significant expansion of the offensive. A military spokesman said Israel had begun to call up 18,000 reservists; that's in addition to the 50,000 who have been mobilized in recent days. No sort of end-game has come into focus, Shapiro reported on All Things Considered. There's no peace agreement on the table. And while the military says its goal is Israeli security, it's not clear what that means. Hamas, meanwhile, remains diplomatically isolated, facing a skeptical Egyptian regime. Khaled Meshal, the political leader of Hamas, told Agence France-Presse from his base in Qatar on Friday that the ground operation was "bound to fail." "What the occupier Israel failed to achieve through its air and sea raids, it will not be able to achieve with a ground offensive," he said. "Both sides know this is a temporary incursion and will not resolve any larger political questions since Israel and Hamas don't negotiate with each other," writes NPR.org international editor Greg Myre. The conflict began 11 days ago. Hamas has fired more than 1,500 rockets at Israel in that period, The Associated Press reported. Israel, the news agency said, has conducted about 2,000 airstrikes. As we noted Thursday, Netanyahu's office instructed the army to prepare for the offensive after Hamas rejected a cease-fire proposal brokered by Egypt. But the two sides mostly observed a five-hour cease-fire Thursday to allow humanitarian aid to reach Gaza. The latest tensions reached a flashpoint over the abductions and slayings of four teenagers — three Israelis and one Palestinian. Until then, Israel and Hamas had observed a truce since 2012.